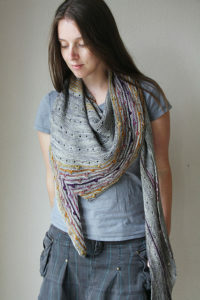 Come knit this beautiful shawl with Alison. You need 800 yds of MC and no more than 40 yds of 5 contrast colors which makes this project great for using mini skeins or scraps! Rainbows break through a cloud-gray background in Solaris, an asymmetrical triangle shawl drizzled with eyelet rows. Short row sections knit in a contrast color create smaller triangles inside the shawl, and the lower border is streaked with stripes and bobbles. KAL’s are free to join but we do ask that you buy your materials from us.